He touched on why the podcast appearance made sense strategically. 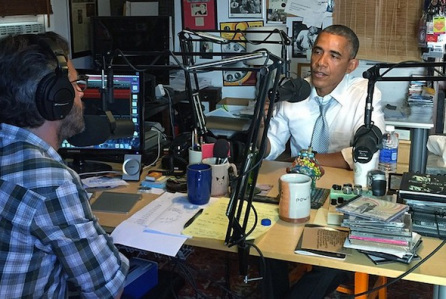 You’ve already heard that President Barack Obama stopped by the garage of comic Marc Maron to record an episode of his popular podcast WTF last week. Of course this was an important topic of conversation…as was the matter of last week’s horrific shootings in Charleston. But for the purposes of this blog, we were more interested in the brief moment that the President spent discussing his PR strategy. “Increasingly, I’ve spent my time thinking about, how do I try to break out of these old patterns that our politics has fallen into…which is part of the reason why I’m here. Obama then goes on to discuss the limits of his own power. But this exchange was key to us because it speaks to the same strategy that led the President to go on Jimmy Fallon and The View and to talk healthcare with Zach Galifianakis. This is an attempt to communicate with the public via unique and unexpected channels in the interest of reaching audience members who may be more receptive to messages in this manner via this medium. In other words, the President described the key challenges faced every day by professionals working in the public relations industry, whether their jobs happen to touch on politics or not.